Experience the thrill of Virtual Reality viewing for all your videos and images from anywhere with Monster Digital's state-of-the-art Virtual Reality Headset. Fully compatible with the Monster Vision VR and Monster Vision 360 cameras. Experience the thrill of Virtual Reality viewing for all your videos and images from anywhere with Monster Digital's state-of-the-art Virtual Reality Headset with Integrated Headphones. Fully compatible with the Monster Vision VR and Monster Vision 360 cameras. 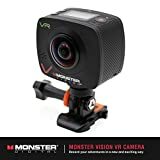 Monster Vision 360º Action Sports Camera - Record and Relive More of Your World! The Monster Vision 360 camera gets you in the game of recording your adventures in a new and exciting way and sharing them with friends and family! Get closer than ever to reliving your events and experience them from a new perspective. During playback viewers are able to choose where they look. Tilt up, zoom in and see all the way around 360 degrees for a truly immersive experience.